French painter Claude Monet (1840-1926) is now world famous for his paintings, especially those of the water lilies in his pond at Giverny, in northern France. Visit any art museum shop, and most posh gift shops, and you’ll find the water lilies there somewhere; on cards, scarves, coasters, posters, key rings and who knows what else. The water lily paintings, however, came at the end of Monet’s long career. Before that, like many Impressionist painters (as we’ve seen here and here) he recorded various transport scenes as he came across them. 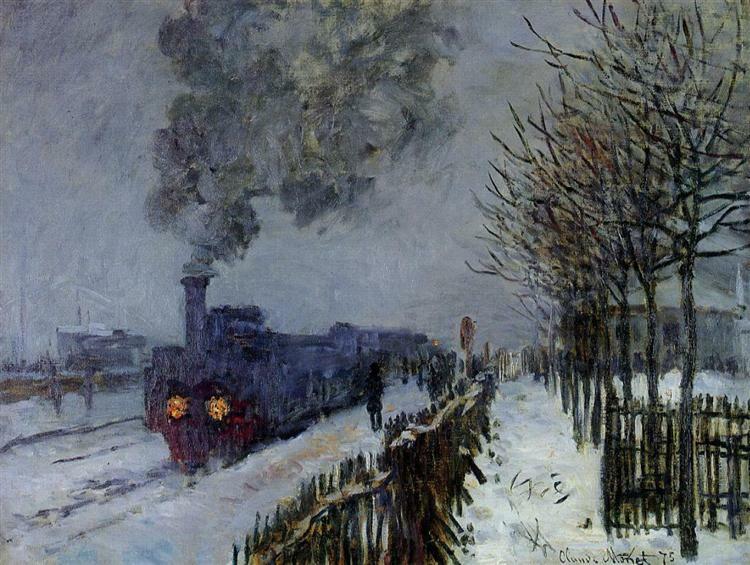 But unlike other Impressionists, you get the distinct sense that Monet didn’t just paint transport because he came across it, but actively sought out transport scenes, especially those involving railways, to paint. 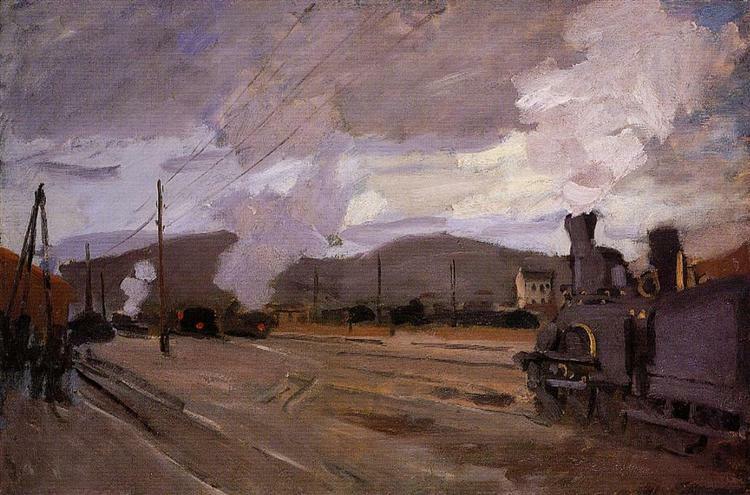 Railways, in particular, intrigued him because steam locomotives allowed him to record the changing effects of light on the clouds of smoke they produced. The point of Impressionism was to paint what was actually there, not what colour things were in their unadorned state. So if yellow/orange light was lighting up smoke from below, and blue skies were reflecting on it from above, then the smoke could – and should – be painted in shades of yellow or orange or blue, as the situation required. It was this that really marked out Impressionism as a break from the artistic conventions of the past, which preferred to represent objects in their natural colours rather than those they take on in the variable lighting conditions of the real world. Monet seems destined to have been an artist. He went to school with Pierre-Auguste Renoir (1841-1919) another artist who would become important in the Impressionist movement. Monet seems to have taken to painting completely naturally. His early paintings are highly detailed, and much more Realist than his later works (see his “View At Rouelles Le Havre” (1858)). Once he got into the habit of painting though, he couldn’t stop. 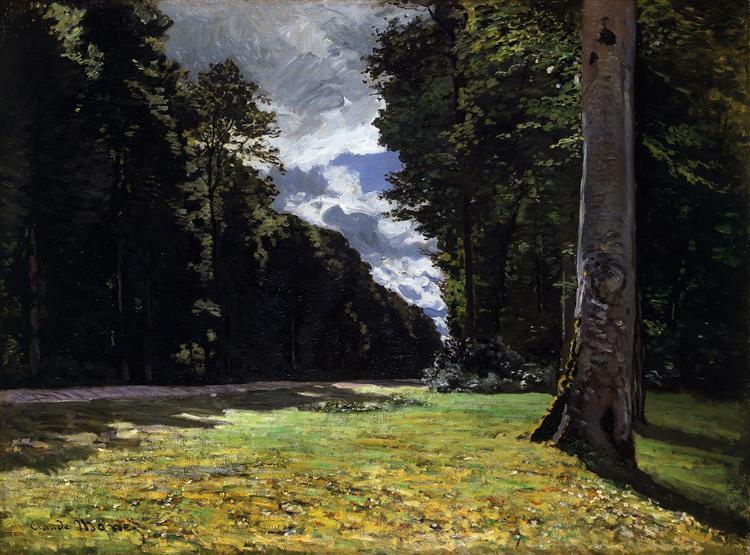 He was an obsessive, often repeatedly painting the same scene under different lighting conditions to see how its colours changed according to the time of day, or which season it was. His paintings soon lost some of their fine detail in favour of capturing the mood and quality of light of the scene. 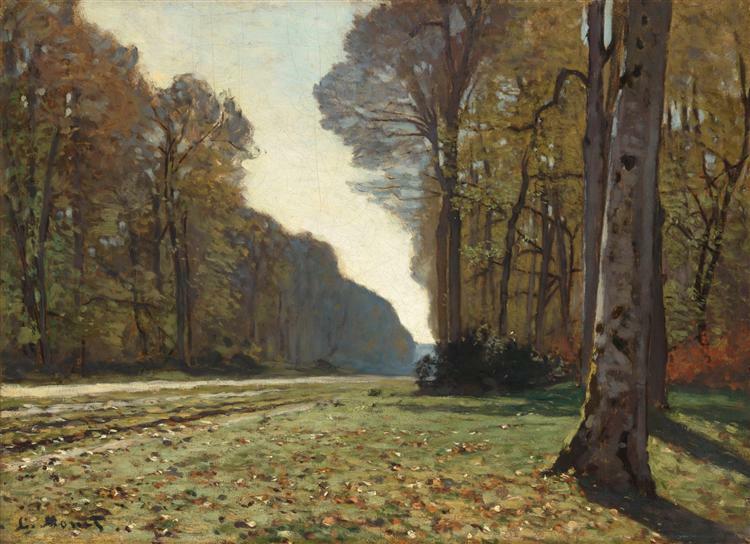 Take a look, for instance, at these two early paintings of The Pave de Chailly, completed in 1865. It’s the same scene, at two different times, and the colours are completely different. Even the shadows are different, deeper in the summer painting, and lighter in the autumn painting, retaining more of the colours of the ground on which they lie. But you’re here to see Monet’s work on transport. As far as I can tell, the first is his “The Train in the Country” of 1871. To be fair, the train is really a background feature here, with the locomotive obscured by trees. I’d like to say that he doesn’t seem bothered about capturing the proportions of the carriages terribly accurately, but I was wrong in assuming that JMW Turner had painted the locomotive in his “Rain, Steam and Speed” (1844) out of proportion. So it’s quite possible that early French railway carriages actually looked like tiny square boxes. 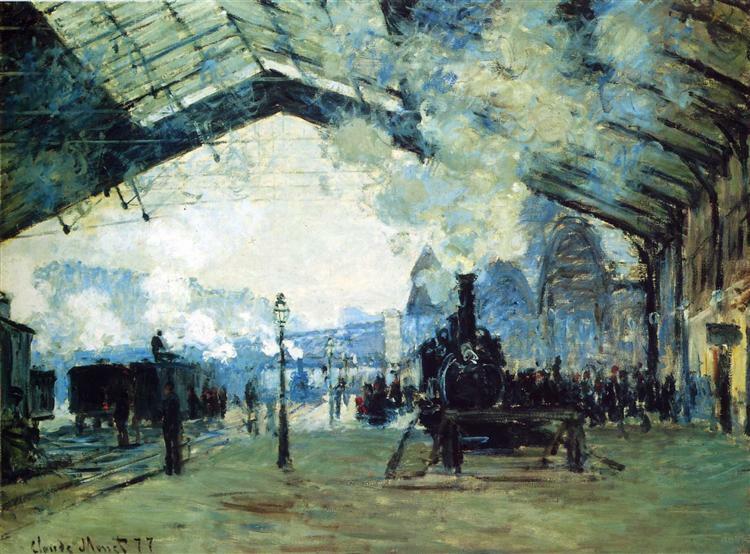 Don’t worry about the lack of detail on the smaller trains (though the locomotive in the foreground of “The Railroad Station at Argenteuil” is brilliantly rendered considering the sparsity of the brush strokes, and presages the style of Edward Hopper, who also painted the odd train). What you’re looking at here is the colour of the smoke. Smoke itself varies between whitish and very dark grey. 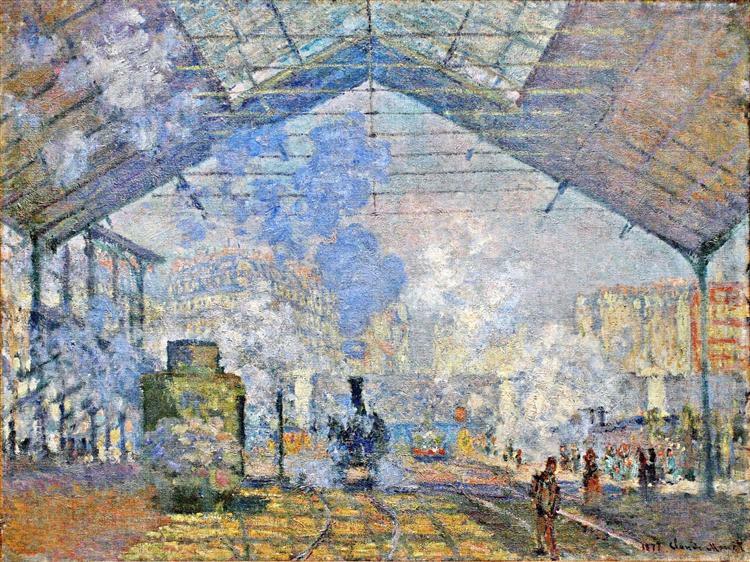 But in “The Train” the smoke is depicted with tints that include yellows and pinks, while in “The Railroad Station at Argenteuil”, lilac is a major ingredient. The recognition and accurate replication of the effect of lighting conditions on found colours was the Impressionists’, and Monet’s, great insight. In fact, Monet gave his name to the Impressionist movement. 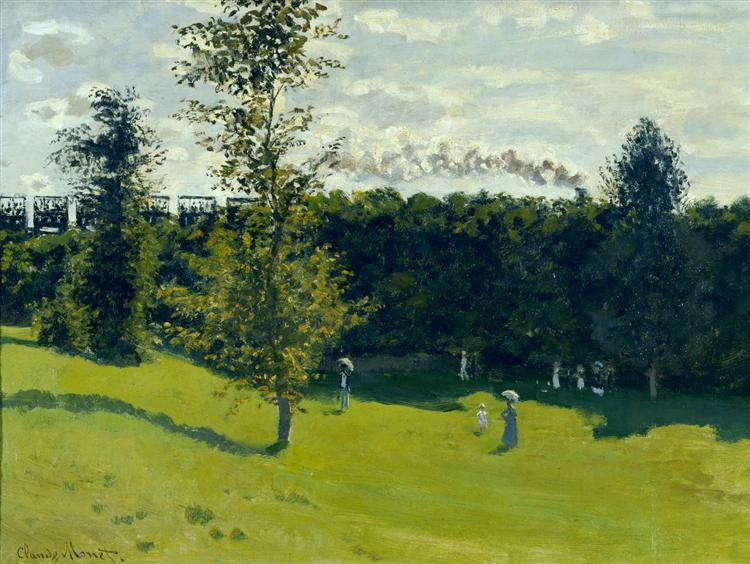 In 1874, Monet and those who painted like him (including Renoir and Pissaro of various other railway paintings fame) held their first major exhibition in Paris. A leading art critic of the day invented the term “Impressionism” after the title of Monet’s “Impression, Sunrise” (1872). It wasn’t generally used as a compliment. The Impressionists scandalised the art world with their new techniques, but they adopted the name and claimed it for themselves, slowly becoming accepted and then embraced over the following decades. 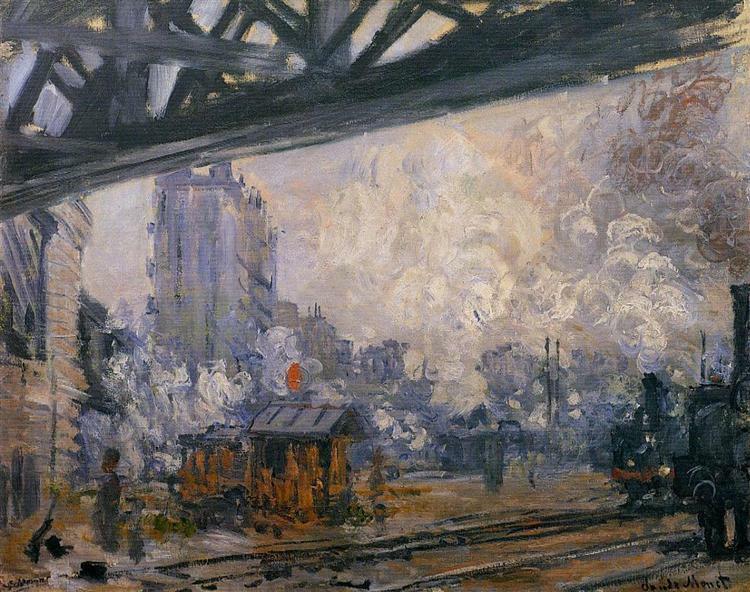 As well as railways, Monet painted other transport subjects, including “The Bridge Under Repair” (1872) and “Coal Dockers” (1875), a strikingly gloomy portrait of river freight transport, in sickly shades of yellow and brown which I presume result from a pea-souper fog caused by the burning of coal, the very product whose transport is being depicted. 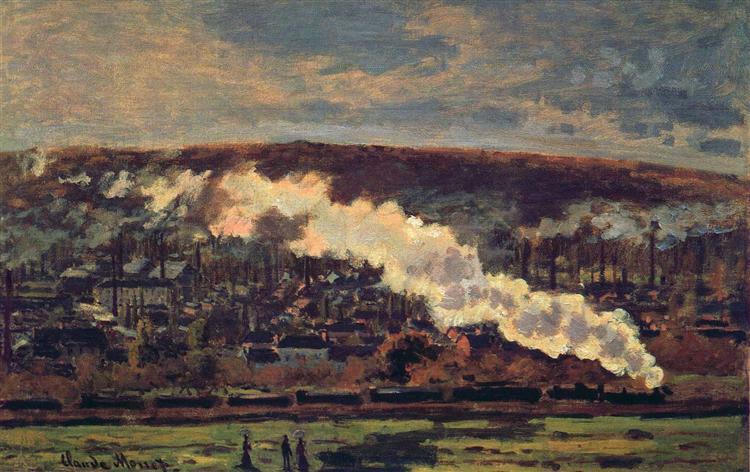 But it was railways to which Monet returned time and time again. He painted four views of the railway bridge at Argentuil, three of which are from an identical viewpoint, but in which the lighting conditions or detail in the brushwork (or both) vary between canvasses. “Arriving at Montegron” (1876) features a train seen alongside what looks like an allotment, but one of my favourites is “Train in the Snow or The Locomotive” (1875) (not to be confused with “Train in the Snow at Argentuil” (1875)), which I most recently came across used as the cover of a novel. It’s a chilly, gloomy dusk (maybe dawn, but I don’t think so) view of a train waiting at a station, capturing that moment when it’s not actually dark, but details are becoming lost and artificial lights become prominent. There were quite a few others of Saint-Lazare station too, as you can see here. However, these were his last major transport paintings apart from the occasional barge, or paintings of London bridges, increasingly blurred and indistinguishable behind translucent sheets of colour. Monet’s wife Camille died in 1879, and he threw himself into his work even more than he had done before. If there were examples of repeated attempts to capture different qualities of light at the same location before 1879, afterwards you can find so many examples that is seems to have become an even stronger obsession, and you can’t help feeling that Monet for ever after translated his grief into work. Take, for instance, the number of paintings of haystacks he completed. He moved to Giverny in 1883, having spotted the location (appropriately enough) from a train. He settled there and made his large garden, including the pond which he filled with waterlilies. Over the rest of his life, he these painted as obsessively as anything else, battling against failing eyesight caused by cataracts. 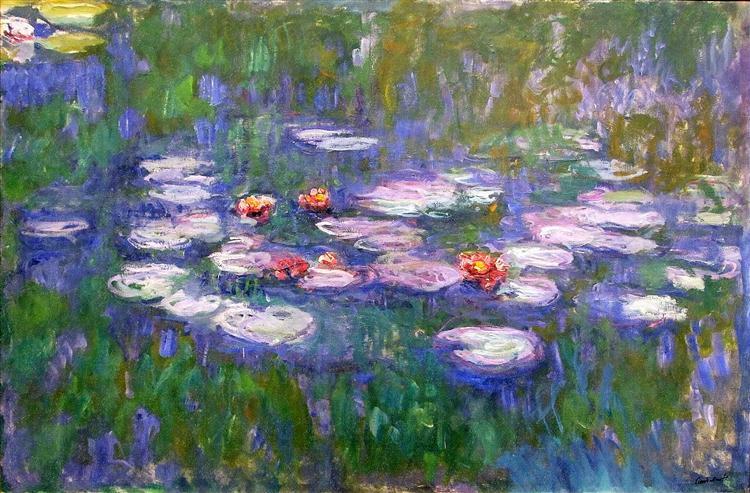 The effect of those cataracts are said by some to be distinguishable in his paintings, and apparently the colours used in the waterlily paintings change after an operation to remove his cataracts. Monet continued to paint until his death. Unlike Van Gogh, who died before he gained recognition, the world caught up with Monet while he was still alive. He had the satisfaction of seeing his work appreciated, and it is still appreciated today, even if the wider world most frequently recognises him for his water lily paintings rather than the record he left of late 19th Century transport. They’re all over the place, but an internet search will usually turn up the exact location of any particular painting pretty quickly. Fascinating! Fine art and the railways, what a combination. Keep up these interesting angles on transport. The coaches in “The Train in the Country” look like they could have been “Imperiales,” which were very short four-wheel double-deckers, which could account for the boxy look. Sorry, hadn’t seen the comment by Michael Cross when I posted this. I think he’s right.